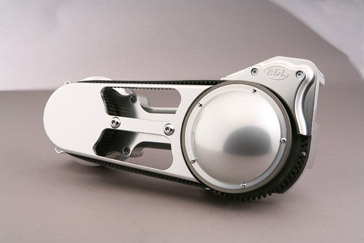 EV-575 Series | Belt Drives, LTD. The latest in a long line of trend setting drives, the EV-575 offers enthusiasts a number of significant advantages over other aftermarket and stock systems. 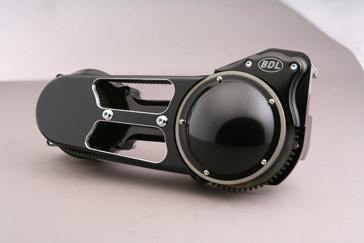 First, BDL’s reinforced 2″ belt was developed specifically to handle the high torque and horsepower numbers being produced by today’s big inch V-Twin engines. 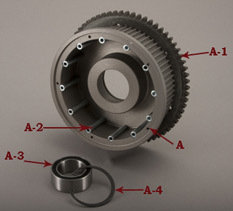 Additionally, the system incorporates a one-piece billet motor plate, unique side guard and rear pulley cover along with the traditional BDL starter housing. 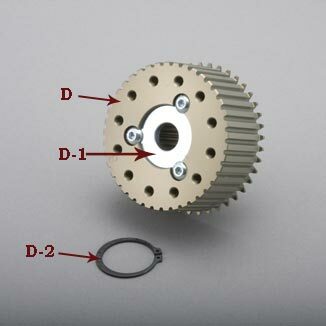 Every EV-575 kit includes the very latest in clutch technology with BDL’s own patented Ball Bearing Clutch. The state of the art design offers up to 30% more contact surface, reduced lever pull, smoother transition, super quiet operation and flawless clutch engagement. 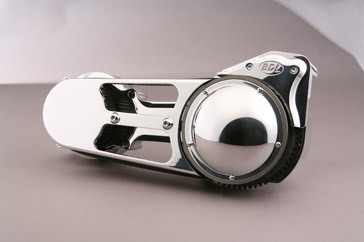 Fits 1990-2006 Softail®. Available finishes: Polished, Black (B) and Clear Anodize (CA).